Nonprofit providers take their community benefit/social accountability measures seriously. That means not just doing good, but actively quantifying and reporting your activities. In measuring the social contribution that LeadingAge members render to their communities, a bit of Mark Twain wisdom comes to mind. “Always do the right thing; this will gratify some people and astonish the rest,” he is reported to have written, in a 1901 note to the Young People’s Society at Greenpoint Presbyterian Church in New York City. People would be astonished to find what LeadingAge members contribute in social accountability. For a couple of LeadingAge members, the measured benefit from their presence in their communities ranges from $10-20 million. But, it’s more than just about money. If We Did Not Exist, What Would be Lost? According to Erickson, that community benefit totals $10 million for its 12 life plan communities coast-to-coast, as well as its at-home care services, and other sites. Covington operates in 9 states, all of which have an interest in what the organization contributes to its communities. He says that while Covenant always reported its financials and other metrics on an annual basis until recent years, it never took the time to measure its community benefit. 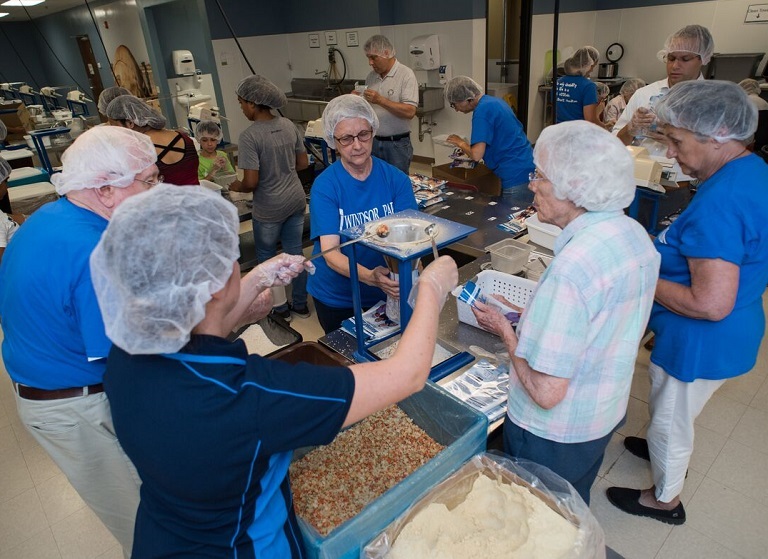 Residents, staff and family members from Covenant’s Windsor Park retirement community in Carol Stream, IL, joined forces With Feed My Starving Children to pack food for children in El Salvador and Jamaica. The group packed 67 boxes, which translates to 14,472 meals. The organization provides nutritionally complete meals specifically formulated for malnourished children; the boxes packed by our Windsor Park team will feed 39 kids for a year. Photo courtesy of Covenant Retirement Communities. It turns out, it's an exercise that inspires. He added that a big part of the impact comes from the money communities raise for their benevolent funds, which help sustain residents who have run out of assets. But they also measure direct contributions to outside organizations, as well as volunteer hours residents and staff provide to other nonprofits. For example, he cited one community in which residents assist in an English-as-a-second language program. Erickson also says that documenting social accountability comes in handy when making the nonprofit case to community leaders. Covenant has shared the information in such matters as zoning, variances, and even state policy changes. “This information elevates our work, and we get good feedback on it," he says. "Ultimately it is a key component to our nonprofit status … and the overall mission of our organization." At Acts Retirement-Life Communities, community benefit comes in at around 5% of operations—about $20 million across 22 nonprofit life plan communities in 8 states serving 9,000 residents. Jefferson Kaighn, executive vice president & chief administrative officer, personally coordinates social accountability throughout the organization. While stories about community benefit are highly valuable, he says the benefits of measuring social accountability give communities more than great stories to tell; it provides a quantifiable impact. It is validation and offers a specific measurement of benefit to the greater community. To accomplish this measurement, Acts trains staff to measure socially accountable activities using licensed software. This collected data is, in turn, shared in an annual report to the organization’s audiences—residents, staff, communities, boards and local governmental officials. “We believe this demonstrates our true charitable nature and the impact we have on our greater communities,” says Kaighn. “It communicates … that we are contributing mightily to those communities and our communities are better off because we exist in them. Acts Retirement-Life Communities also chooses to pay property taxes, or payment in lieu of taxes, in many places. This, Kaighn says, makes them good corporate citizens as well. While the organization may be unusual among providers in this regard, more and more organizations are looking to demonstrate their social accountability to protect the financial viability of their mission. 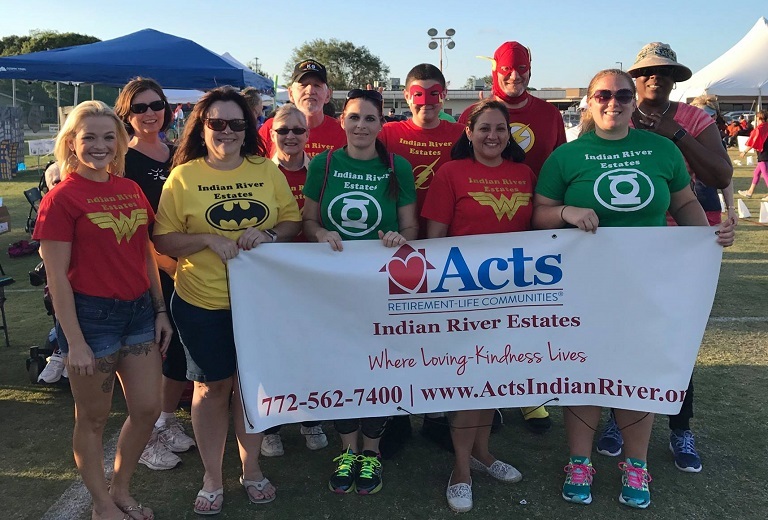 Acts’ "superhero" residents and staff at Indian River Estates joined the American Cancer Society’s Relay for Life in Vero Beach, FL. Wearing the logos of Batman, Wonder Woman and The Flash, Acts employees walked alongside inspiring cancer survivors who completed a victory lap on the field. Photo courtesy of Acts Retirement-Life Communities. She says that providing and recording social accountability has other benefits. Aging services providers (and in particular life plan communities) should care about a vibrant social accountability program. Kaufmann says such a plan could also build social capital within the community, insulate them from public criticism, and identify unmet charitable needs in their community. All this enhances mission, she maintains. To accomplish this, she notes that there is software available that offers a systematic method and plan for defining and collecting data on social accountability. Trina Hackensmith, vice president at Lyon Software, which is designed for this purpose, notes that increasingly life plan communities are operating in a “prove it” world. According to Hackensmith, organizations are becoming more strategically focused on social accountability initiatives. She says that many senior living communities have a long history of serving the aged. Social accountability is a way to give their good work “feet” to get traction, to have good deeds recognized. “I believe that the smartest communities are those who have found innovative ways to collaborate with other nonprofit and/or for-profit organizations and leverage resources to make their communities safer, healthier, better places for everyone, especially seniors,” says Hackensmith. Hospitals are a close cousin to the long-term care sector, as about 60% are classified as nonprofit (as opposed to for-profit or governmentally owned). Sara Rosenbaum, J.D., a professor at George Washington University, notes that hospitals are required to follow very strict IRS guidelines in measuring and stating community benefit. She and a research team released a study in December 2016 titled Improving Community Health through Hospital Community Benefit sending: Charting a Path to Reform that may offer insight to LeadingAge members about what their social accountability future could hold. She supports making the social accountability case. Cory Kallheim, vice president of legal affairs and social accountability at LeadingAge, believes for the time being that federal tax exemption status for members is not at risk. There was, he says, nothing in the recent tax bill that addressed 501(c)(3) status. But he added that the “vast majority” of members are not yet adequately capturing and telling their story. “It’s the right thing to do. Being socially accountable is very good for the brand,” he says. “Our members have a lot of touch points in the community, and they need to tell their stories." To help, LeadingAge offers a social accountability guide and a variety of other resources to help members get started. There are, Kallheim stresses, other advantages, from being considered as the premier employer in a community to helping with fundraising. “It can be tough to do, but it makes an impact on the optics of the community,” Kallheim adds. Erickson agrees with that assessment. He says Covenant’s program is a challenging one that amounts to extra work for the staff and expense for the organization.